GeoConverter - Free Online Geospatial Data Converter (since 2008). Reads and writes several GIS vector file formats based on the famous OGR tools. A service by Geometa Lab at HSR. GeoConverter is a static ('1:1') geospatial file data format converter and coordinate transformer. It is running as a webapplication and designed to be used by technical users who casually have to convert GIS and GPS data. Possible source GIS vector file formats are mostly the same as the target file formats (see the FAQ below). GeoConverter is based on the OGR open source library, especially on the OGR2OGR commandline tool as documented in the OGR pages. It's possible that in the future GeoConverter get's an additional machine-machine interface and this would be a typical Web Processing Service (WPS). Kartographische Nachrichten, KN 1/2012 „ATKIS-Basis-DLM und OpenStreetMap – Ein Datenvergleich anhand ausgewählter Gebiete in Niedersachsen“. MyGeoData - GIS Data Converter - Convert from/to many GIS formats. Uses OGR (like GeoConverter) and GDAL and supports all their formats except databases and webservices. ogre - ogr2ogr web client! The file names must not contain any non-ASCII character. and they must be in the same folder in case of zip and tar files, i.e. do not put datasets into folders when you pack them to the zip file (except formats that contains folders naturally - like KML). The source file format of the file(s) to be uploaded is determined based on file extension. If you have CSV as source file format, to upload follow the special formatting described below. If your target file format is INTERLIS (.itf or .xml), make sure you provide also an INTERLIS (target) model file (.ili). Always set the target file format. When converting to GPX, input points are written as GPS waypoints, linestrings are written as GPX routes. If KML is your target file format and you have data in a different CRS you must always determine and set a source CRS and set the target CRS to 4326 (meaning EPSG:4326). This is because KML always defaults to WGS84 - EPSG 4326, the 'GPS system'. CRS parameters may be left empty (except KML). If no CRSs are given, the conversion leafes the coordinates unchanged. Supply always both (i.e. source and targen) CRS parameters. These are Frequently Asked Questions (FAQ) for the GeoConverter documentation Wiki. What to do when conversion fails in general? Scan these FAQs (:->); Read the chapter "Rules for uploading files" above. Try to upload one of the example files given below. What to do when SHP conversion fails? Make sure you provide an accompanying .DBF and .SHX files and make a ZIP file with all three. If you also include a .PRJ file, then GeoConverter will get the source CRS from the "PROJCS" field, if available. What to do when converting to KML fails? See the rules regarding CRS above saying that you always have to provide source the CRS no. (to whatever CRS the source has) and to set target the CRS to 4326. What to do when converting from KML to some other format fails? First, the KML input parser is - like many parsers - sensitive to encoding. Ensure, it's UTF-8. Second, the KML parser can processes only geometry, title and one additional attribute - by default 'description' - from the KML source. Last, see the rules regarding CRS above. What to do when converting to KML succeeds but Google Earth displays nothing? First, KML is an XML dialect so check the question about GML and GPX above. Second, KML assumes the GPS coordinate system WGS84. So check if you have filled in both numbers in the fields "Source EPSG no. :" and "Target EPSG no.:". Search for these EPSG numbers in spatialreference.org. What to do when MIF conversion fails? Make sure you provide an accompanying .MID file and make a ZIP file with both. GML or GPX fail to convert, what to do? These formats are XML file formats. XML is a human readable ASCII format with a very rigid structure and encoding. There are readers which validate the input and even complain about the character encoding. Often when there is an encoding called 'UTF-8' but the file comes as Windows 'ANSI'; so you have to look for an editor or a tool which writes a proper UTF-8 encoded file. What to do in general when the conversion fails? Check, if your input file is not bigger than 100 MB. If you have not uploaded a zip file, zip it and try again. Read the FAQ and check the rules given here. Finally, if the problem persists consider dropping us a mail. Where can one submit bugs and feature requests? Here at the bottom of the Wiki discussion page. Well Known Text, i.e. geometry values in string representation. Typical examples are POINT(1 1), LINESTRING(1 1, 2 2, 3 3) and POLYGON((1 1, 2 2), (2 2, 3 3), (1 1)). See WKT for more information. What to do when INTERLIS conversion fails? Make sure that both files, ili and itf, have the same base file name. And INTERLIS 2 is still not fully tested. How do I create an INTERLIS model file (.ili) when converting to INTERLIS? That's a feature missing in OGR. First, you have tobe aware that OGR is a 1:1 converter. And the INTERLIS format requires that any data file is accompanied with a model file (.ili). This applies also when writing to Interlis format. Currently, you have to guess the structure of the source format (see e.g. Shapefile attributes) and write an INTERLIS model file by hand using a text editor. Which file formats are supported by this webapplication? What is a layer and a dataset? An OGR feature object encapsulates the values of a whole feature, that is a geometry and a set of attributes. A layer object is a collection of features (objects) of the same feature class. A data source represents a file or a database containing one or more layer objects. Note that 'layer' definition and 'feature class' definition are essentially the same. Layers have a reference to a spatial coordinate reference system (CRS). See also OGR for an explanation in german. I see GPX but can't find any other GPS file formats? GPS file formats like NMEA or Garmin (.gdb) are converted best through existing software. See GPS-Software for more information about this topic. I miss DXF and other CAD file formats? Microstation's DGN (up to version 7) is supported by OGR but not implemeted yet in GeoConverter. DXF unfortunately does not yet exist as a suitable driver for OGR altough some free libraries exist - so, sponsors are welcome! Why do I have to register before using this service? What are you doing with my personal information like my e-mail? We ask for your e-mail and name mainly because of the tedious fight against spam! As a side effect you become part of the GISpunkt HSR community where we send information mails sometimes. These mails are currently sent every other month and will never exceed once a week. Your e-mail will never be used for other purposes whatsoever and we will never give away your personal data. 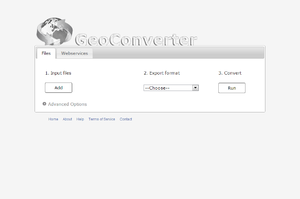 GeoConverter means "Online Geospatial Data Format Converter". Yes, GeoConverter is a free webapplication and it will remain free as long as this service is not abused by daily business cases (e.g. as long as bandwidth remains low). Is GeoConverter a competitor to other converter software? There are quite some professional products around like FME, igtools or InterlisStudio. These products offer more than a straight forward and static 1:1 conversion. They can be manually configured and often support more file formats. So: No! GeoConverter is not meant as a competition but as an enabler of GIS and geospatial data! This user service is brought to you by GISpunkt HSR. It is an experimental project without any warranty. What are the Terms of Service of the GeoConverter? Can these conversions also be run on a local PC? Yes, if you can install some software on your PC: We use OGR2OGR which is delivered among others as FWTools and you can run most conversions locally as it was designed for initially. See OGR for more information about this. Why does .MIF/.MID fail to convert? The file extensions need to be lowercase: .mif/.mid. GeoConverter uses the 'Comma Separated Values' (CSV) reader/writer from OGR. The OGR CSV reader/writer allows to encode geometry by using WKT as attribute values. Unfortunately, CSV leaves many decisions open and most annoying is that the (german) MS Excel is a non-conformant CSV writer. When trying to upload CSV from MS Excel some re-formatting is needed before hand (see ATTENTION), e.g. replacing semi-colons with colons, removing double quotes etc. The first line must be a column header (upper or lower case). "LON" followed by "LAT" and a "NAME" attribute. LON/LAT are floating point values (e.g. 47.355). Attribute values may (but must not) be enclosed in paratheses. "LAT" followed by "LON" and a "NAME" attribute. LAT/LON are floating point values (e.g. 47.355). Attribute values may (but must not) be enclosed in paratheses. "longitude" followed by "latitude" and a "NAME" attribute. longitude/latitude are floating point values (e.g. 47.355). Attribute values may (but must not) be enclosed in paratheses. "latitude" followed by "longitude" and a "NAME" attribute. latitude /longitude are floating point values (e.g. 47.355). Attribute values may (but must not) be enclosed in paratheses. "ID, NAME, THEGEOM". THEGEOM attributes (alternate name 'OGR_GEOM_WKT') have to be formatted as WKT, i.e. with no comma but including the parantheses. There can be more attributes than these three. 1, Wert 1, "POINT(12.375 49.618)"
2, Wert 2, "POINT(16.198 50.431)"
3, Wert 3, "POINT(19.628 51.389)"
Get your sample files by clicking to the links below. The data is about Swiss train stations and its of geometry type POINT (see WKT). Do you have any feature requests, bug reports and suggestions? We appreciate every feedback! Please go to the "discussion" ("Diskussion") tab of this Wiki page and put it there by adding (+) your feedback on the bottom. Release 1 - around 20. Dec. 2007, with GDAL/OGR 1.5.0b1 from FWTools 2.0.2. Obwohl wir mit Sorgfalt auf die Richtigkeit der veröffentlichten Informationen achten, kann hinsichtlich der inhaltlichen Richtigkeit, Genauigkeit, Aktualität und Vollständigkeit dieser Informationen keine Gewährleistung übernommen werden. Haftungsansprüche gegen die Website-Betreiber, welche aus dem Zugriff oder der Nutzung der veröffentlichten Informationen, durch Missbrauch der Verbindung oder durch technische Störungen entstanden sind, werden ausgeschlossen. Es wird jegliche Verantwortung über Inhalte verlinkter Webseiten abgelehnt. Diese Webseiten sind frei nutzbar. Eine kommerzielle Nutzung der angebotenen Daten bzw. Dienste ist nicht gestattet. Aus technischen Gründen kann kein Anspruch auf uneingeschränkten Zugriff gewährleistet werden. Die Website-Betreiber behalten sich ausdrücklich vor, Inhalte ohne Ankündigung zu ändern oder zu löschen. Der Schutz der Privatsphäre und namentlich der Datenschutz sind uns wichtig. Daten werden streng vertraulich behandelt und weder an Dritte verkauft noch weiter gegeben. Es werden lediglich unpersönliche Nutzungsdaten gespeichert (Logfiles) ausgenommen freiwillige Registration. Die Nutzungsdaten werden nicht mit persönlichen Daten verknüpft. GISpunkt HSR. Eine Weiterverwendung der Grafiken und Informationen im Rahmen von Publikationen oder Internetseiten ist nur unter Anführung eines Quellenhinweises "GISpunkt HSR www.gis.hsr.ch" zulässig. We exclude any liability. There is no responsibility on the data converted nor on the content of the linked websites. This is a free service. Any commercial re-use of this service is not allowed. No unlimited access is ensured. The site operators reserve expressly to change or delete the content without prior notice. The protection of privacy and data protection are important to us. Data will be kept strictly confidential and not sold or shared. There is no personal data involved (log files) except for the voluntary registration. A re-use of graphics and information through publications or web pages is only Citing a source reference "GISpunkt HSR www.gis.hsr.ch" admissible.